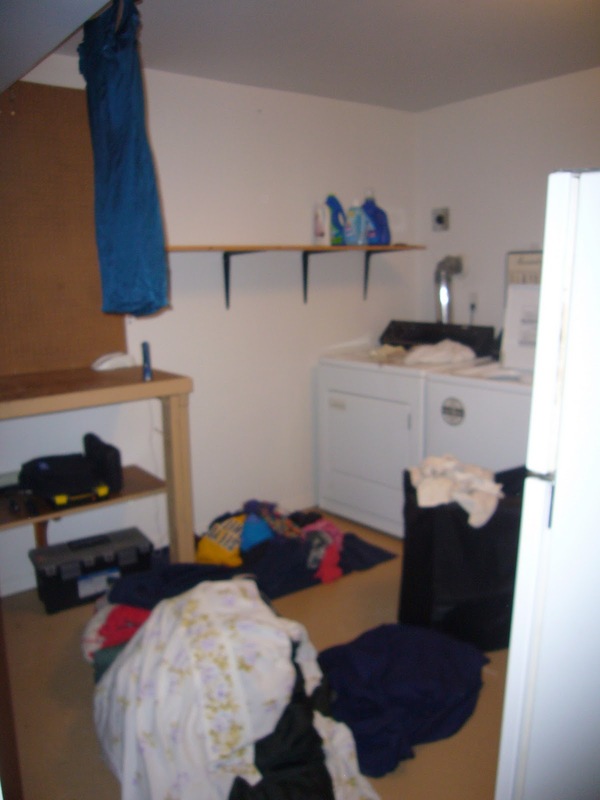 As many of you can probably relate with, I loath doing laundry. 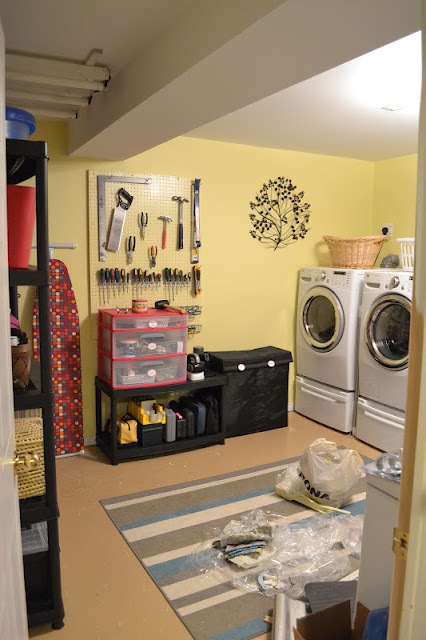 Since it's a necessary evil of life, I decided I wanted to make it as happy an experience as I could, which meant updating the laundry/utility room. The space wasn't working for our needs. You can see from the photos below, taken quite some time ago, the room just wasn't being utilized well, not to mention it was hideous! Sorry for the fuzziness - old, crappy camera at work! As you can see we had a work bench that really wasn't getting much use other than storing things on, random shelving and hooks all over the place, not to mention a dinosaur fridge. A while back I called a company that picks up old appliances for free to use for scraps. It was so nice getting ride of that. We bought 3, 4 shelf units from Rona. They just happened to be on sale for $29.99, score! Gotta love the florescent lighting, which we will hopefully replace eventually. I labeled everything that I could using scrapbook supplies and my handy dandy label maker that Michael randomly bought me right after Paisley was born because he knows how much I LOVE labeling and organizing things. To him it's super weird how much joy it gives me. 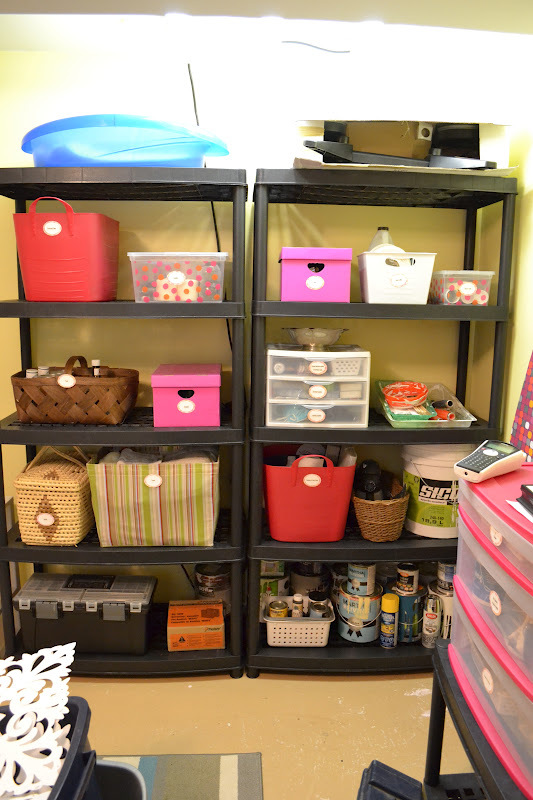 But, seriously my brain functions better when things are organized and labeled. Anyone else?! I had Michael cut down a piece of the old peg board. I then primed and painted it with a glossy version of the color on the wall. I originally chose this color, Martha Stewart's Yellow Gerbera for Paisley's room, but then changed my mind. So, I had a full gallon of it in eggshell and a quart in high gloss (had the intention of doing glossy horizontal stripes....never happened. 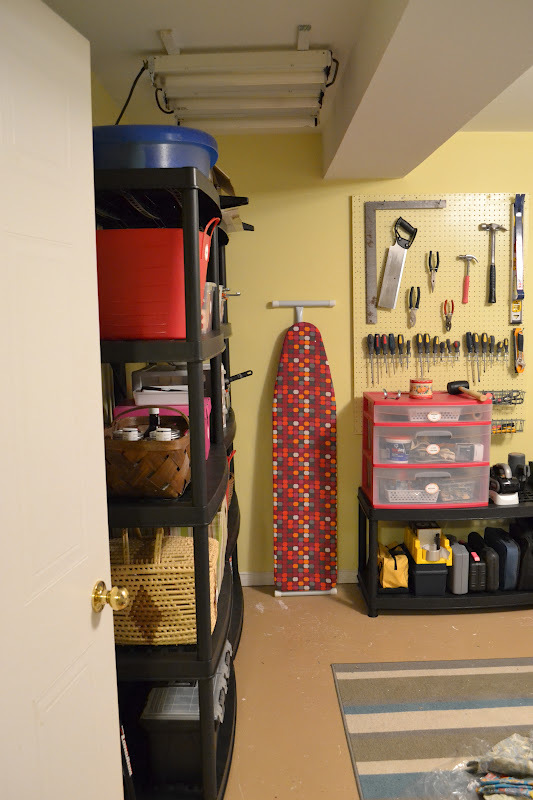 So when it comes to storage, perhaps you can gather that I'm pulling from what I already have, my ironing board. It's fun enough and I already had the pinky colored plastic 3 drawer thing being used for my scrapbooking supplies. Needless to say I'll need to find a new home for my scrapbooking things....details. The view when you walk in, below. Yes, hoping to change out the lighting and rug...eventually. This side of the room needs some serious help. I want to get a few curtains to actually block off this mess. It just looks so cluttery (yes, I make up words!)...eww. You will notice the white unit next to the utility tub is actually what was in Paisley's room. We have since gotten a new wardrobe as this one was simply getting too small. When I moved here (just over a year ago after getting married) we hauled all of my belongings from Texas and these fancy pants Samsung laundry machines (as Michael refers to them as) came with! Poor hubby. Somehow I'm always creating more work for him. He's such a keeper! Haha, thanks for making me feel less crazy! You can borrow the labeler any time! However I would LOVE to have a Silhouette, which can create the fanciest labels! To bad they're like $300!